My biggest complaint against NaMo and his govt has been his wholesale swallow of Al Gore's hypotheses. This one issue has the power to seriously hamper India's economy. We must analyze this issue to the utmost. Perhaps build up an alternate knowledge and pressure group. We have a lot of people on this forum , with science and math background. The raw data to begin with is murky. but even its analysis is shoddy. This is a politically motivated propaganda masquerading as scientific certainty. Lets expose this canard. Of course if the data proves me wrong, thats ok too. Not that India should have to bear even a single dollar's cost on this. wiki wrote: A global warming hiatus, also sometimes referred to as a global warming pause or a global warming slowdown, is a period of relatively little change in globally averaged surface temperatures. In the current episode of global warming many such periods are evident in the surface temperature record, along with robust evidence of the long term warming trend. There is no scientific evidence to support global warming as far as I understand. The government is also spending a huge amount of effort on doubling coal output by 2019. It fixed the coal block allocation scandal. In fact, the coal output has grown so much in the past year that tens of billions in coal imports have been avoided - a link to this was posted in the economics thread just days ago. Further, they refused caps on emissions multiple times at global fora. And it is a significant increase in output from Coal India that has led to a gradual tapering down of imports. But the fact that coal imports still amounted to almost 13 million tons in September is a scandal. India currently produces about 650 million tons of coal a year. The Modi government has publicly announced that it wants output to increase to 1.6 billion tons by 2019. Do remember, coal blocs have been allotted again to private players through a bidding process. Who knows, this might become a rare success story of a government policy? India’s coal imports in September fell by 27.16 percent to 12.6 million tonnes (MT) from that in the same month a year ago on the back of rise in domestic production, the government said on Monday. “With unprecedented increase in coal production by Coal India, import of coal comes down for third successive month,” Coal Secretary Anil Swarup tweeted. “Coal imports down from 17.3 MT in Sept 14 to 12.6 MT in Sept 15. In value terms from Rs 8,598 crore to Rs 6,027 crore, a reduction of 30 per cent,” he said in another tweet. State miner Coal India had recorded an output of 494.23 MT in the last fiscal, which fell short of the production target by 3 percent. The target for the current fiscal is 550 MT. Solar rates in India touched a new low in the tender for a 500-Mw solar park in Andhra Pradesh issued by the Ministry of New and Renewable Energy (MNRE). US-based SunEdison won the bidding round by quoting Rs 4.63 a unit. In a close fight during the first reverse auction for solar projects held on the online platform, 10 bidders quoted below Rs 5 per unit. Around 15 companies quoted below Rs 5.5 a unit, which was hailed to be the average tariff for solar power this year by the government. Solar power would be bundled with thermal power from state-owned National Thermal Power Corporation (NTPC), which will further bring down the final sale price to Rs 3.5 a unit — the lowest ever — said a person close to the development. The way I see it, the government is acting in a source agnostic manner. They know solar panels are seeing a crash in prices, and therefore want to get in while there's a glut in supply. Simultaneously, they want to cut the coal import bill by dramatically ramping up domestic production. In fact, the push for increased coal production is much further along than anything that's happened on the solar front. So I don't quite agree with the Al Gore thesis of this thread. Taking advantage of a favorable market condition is just smart business. I have seen Modi asking everyone too see Al gore's film in an interview. We cannot look into anybody's mind. Maybe its just positioning on a controversial topic. But this issue creates pressure on us to lower our energy production. Obama, Merkel, Canada have become practically insane on this issue. The general public's brainwashing is complete with the vast majority of population thinking global warming is a major issue. This is a dangerous issue which can hurt our pockets and our country big time if ignored. Atish wrote: I have seen Modi asking everyone too see Al gore's film in an interview. We cannot look into anybody's mind. Maybe its just positioning on a controversial topic. But this issue creates pressure on us to lower our energy production. The government's actions so far show no such thing, in fact quite the opposite - hydrocarbon production and as well as consumption is up significantly. I have no interest in going by words, especially when it comes to interpreting it as an exclusive preference i.e. 'if A then not B'; as a leader I expect Modi to say anything that it takes to drum up business. That's the right bania attitude to have. If his advocacy of Gore's movie helps him get solar panel makers to participate in bidding for local projects, that's absolutely the right business thing to do. Competitive bidding results have shown that his tactic worked. Coal production data also shows that he has no shortage of love for thermal power. When India voluntarily cuts both hydrocarbon consumption and tries to make coal production artificially harder, then I will wake up and listen about the existence of a problem. So far, nothing of the sort has happened, and GoI is just doing the opposite by going gangbusters on coal production while also sweet talking solar and wind power makers to invest. a. Denial of global warming is denial of basic science. b. If you are a gardener, the reality of global warming will be apparent to you. What’s clear, then, is that we are looking at a significant scientific disagreement — one that turns on different technologies, methodologies, and adjustments. In such a situation, scientists will now need to hash this out and reconcile their understanding of what is happening to the gigantic snowy mass of East Antarctica in particular. Here is my take on this issue. Firstly, it is good for India to invest on technologies that will reduce carbon emissions and use alternative renewable energy sources. My dream is for India to become the first hydrogen energy power in the world. We have a huge population and very crowded urban centers. We need technology to keep our water, air and land clean and sustainable. So any money invested in such technologies is not a waste. Secondly, the more alternative energy source we seek, the more independent we will become and the more foreign exchange we can use for another type of trade. Thirdly, unlike the west, India has rich and diverse natural forest areas. We need to preserve them. All said, there is a climate change religion that is being developed in the west to bully emerging economic powers like India. We should make sure we don't fall for that. We also need to make sure that genuine development is not blocked by the NGO giri. As I brought this into various threads, I owe an explanation and will take a bite at this. Let the learned gurus including those that think global warming is basic science also pitch in and I will be open to change my perspective. I am not a gardener btw so may have missed something that is very evident there. A case is made by the developed world (primarily the US) that emission of greenhouse gases increases atmospheric temperature and aids global warming. This was later changed to climate change and a case is made that temperature can shift either ways but over longer term the direction is upwards. There is no clear scientific basis to say this and there is NO consensus among scientific community on this. Regardless proposers of this theory are insisting everyone to accept it and contain the emissions of the gases that will cause increase in temperatures. This has been primarily proposed by communities within US that are more involved with geo-political management of the 'US empire' than rationally arriving at the conclusion, convincing people and providing better alternatives. The reason I say it is because despite not having consensus, the economic implications behind global warming have already been conceived, designed, and implemented in the form of carbon rationing. All developed countries' usage of hydrocarbons is grandfathered at current levels and emerging economies have to deal with complexities arising out of it to grow further. This will make their growth more expensive as energy is vital element to aid growth. Correlation between energy usage and growth is one. The technologies behind achieving better energy efficiency are controlled by the developed world and are inaccessible and/or denied depending on geo-political facors. Developing countries will need to engage in carbon credit commerce in buying right to pollute more than rationed. If this commerce happens perfectly all we will achieve is that we cap emissions at current levels (not reduce) but definitely have made the said commerce a reality. Tomorrow some study will come up with a (suspect) finding that oxygen is reducing and we will have a template for introducing oxygen rationing and therefore population control at current levels. This may sound as stretching but one can't deny that this is a direct implication of this model. By agreeing to this model of global governance, one is also agreeing to shared resource governance/commerce beyond sovereign boundaries and making sovereign commitments that apply not just today but even in future. In short, it has all elements of developed work scamming the emerging economies. Despite all this, our case (Indian case) is unique. We know this is a scam. I am sure NaMo knows it too. But yet, we have to play this game because overall (even if there is 5% of truth) it will still be better for planet. It will make us adopt Solar quickly, it will probably make our environment (not temperature) cleaner; it will tie the western nations in their own game, it will probably make the western nations' objection to our Nuke industry more difficult (not that we care if it isn't), it will for now appear that we are going along until we sort out other bigger problems etc. So, basically, it gels with how we view our duty towards our planet. Nothing to do with the veracity of claim regarding climate change. I too think this may not all be bad for Bhaarath if we can create alternate sources of energy. Having said that, this looks like a simple scam because the people pushing it stand to gain. Even in west, only the Democrats seem to be pushing it because Repubs are known as supporters of oil-coal and vice-versa. A_Gupta wrote: a. Denial of global warming is denial of basic science. a) Carbon emissions are increasing massively due to human actions. b) more carbon emissions means global warming. c) there is a global warming. The carbon emissions due to human actions are quite less in percentage. Carbon itself is quite less in percentage of atmosphere. This correlation between carbon and warming is not at all established. This is the most important point. The whole game is based on this correlation which is not even properly established. Infact, troposphere temperature readings contradict this theory. If there was global warming due to carbon emissions, then the temperatures should have been higher in troposphere. But, there doesn't seem to be any such thing. Infact, the temperatures at troposphere are lower. Carbon is considered as one of the minor greenhouse gas. Water-vapour is a bigger greenhouse gas. The carbon emissions are not really massive. They are really really less in the atmosphere. So, they are unlikely to make any big impact on climate either way. This is the real issue. Is there global warming or not? Please notice that they have shifted goal post these days. From global warming to climate change. Now, climate itself is ever changing, so whats the big deal. Has there been any major climate change in last 100 years when the industrialization has started? How do they measure the global temperature? Scientists use four major datasets to study global temperature. The UK Met Office Hadley Centre and the University of East Anglia’s Climatic Research Unit jointly produce HadCRUT4 . In the US, the GISTEMP series comes via the NASA Goddard Institute for Space Sciences (GISS), while the National Oceanic and Atmospheric Administration (NOAA) creates the MLOST record. The Japan Meteorological Agency ( JMA) produces a fourth dataset. So, basically, its US, UK and Japan joint venture. One interesting thing is that Japan is very big on this climate change thing. Lets assume that there is no hanky panky in these raw numbers. Even then, it is mostly centered around Pacific ocean and north-atlantic(towards the poles). What about Africa and Asia? What about Indian Ocean? Indian Ocean, Africa and Asia make up most of the world in terms of coverage. Surface temperature records have been maintained by measuring with instruments from 1880. Wiki Link. The satellites have been measuring troposphere temperature from 1978. The temperatures did not rise from 1940 to 1975. Instead, they went down. 1940 to 1975 is the heavily industrialized period when carbon emissions were high, yet the temperatures went down. Climate change thing was brought forward in 1992 and Kyoto Protocol was adopted. From 1992 to 2015, its been more than 20 years yet the issue has not been proved at all. By 20 years, if there was climate change, it should have been painfully obvious. After 1992, there has been a global pause in 'global warming' from 1998 for next 18 years. Imagine, that! What great climatic changes have we seen from 1992 to now? The regular climate is more or less the same. Same winters and same summers. Some times the winter comes early, sometime a bit late. Sometimes its warmer, sometimes its chiller. The last winter was especially cold at our place. But, this winter has been quite normal. So, there doesn't seem to be any trend of heating or cooling from normal experience. There has been no global warming atleast in a period of 18 years from 1998. This is called a 'pause' to explain away that there is a larger global warming trend. Now, firstly, the larger trend is really unknown because the temperatures were not known before 1880 period. They are guessed just as they are guessing temperatures for future. From 1880 to 1940, the global temperature rose by just a half-degree Celsius. Just half-degree! And this increase in temperature began long before mass industrialization. The industrialization started in earnest after ww2 because mass production of cars, TVs, refrigerators, washing machines, ...etc were produced. This is called post-war economic boom. During this period, the temperature should have risen if there was a correlation between industrialization and global warming. But, instead, the temperatures fell. And they fell for about 35 years. Imagine that! 35 year! The temperatures again started increasing in 1975 when there was an economic recession. That shows that there is no correlation between industrialization and global temperatures. This whole thing is a big business with many jobs involved. So, you can't expect them to tell you facts which might jeopardize their jobs. And funding is given only to those scientists who support this theory and not to those who oppose it. The developed countries are putting sanctions on the developing countries in the name of 'carbon emissions' without proving that these emissions will lead to any change in climate. The raw data of satellite and other temperature measuring instruments don't proving climate change theory. But, they adjust this based on their models. Now, once they start adjusting the data, all kinds of subjective bias comes into play. If you expect the global warming to happen, then you adjust the data to reflect that. The computer models use a few variables to arrive at their guesses for future and past temperatures. But, they tell us that these models are useless to predict the temperatures in future. For example, can the computer model predict what will be the temperature after 5 yrs? If the computer model can correctly predict the temperature after 5 yrs and the same model says that there is a global warming, then people might be less skeptical. The temperature is being measured from 1880. It shows that the temperatures fell from 1940 to 1975. And there was no rise from 1998 to 2006. From 1998, there was been a 'pause'. Kyoto Protocol was adopted in 1992 which allowed the developed countries to squeeze the developing countries. Democrats are the big supporters of this. So far, its not been proved that carbon emissions leads to climate change. And its not established that there is any kind of climate change: hot or cold. From 1992, 20 years have passed, so the climate change should have been painfully obvious if it was true. I am still open to the idea of climate change thing being atleast partially true if not wholly true. But, so far, I am skeptical. Anyway, I think environment protection is a good idea. But, the developed nations should be leading the way. If the developed nations are serious about environment protection, they should help the poor nations by giving tech and money. They should not be squeezing the poor countries to put more restrictions on the poor. thanks for allowing a proper discussion. This documentary is very informative. ^^^ That thread is very revealing. Those articles were posted in 2007. And they sound apocalyptic. IN 10 years time it will be too late to reverse the effects of global warming, a climate change expert warned yesterday. Its almost 10 years now, yet we don't see any signs of this apocalypse. ^^^ It is a slow motion disaster. Today they can see cyclones a week out, and two days later you ask, where is the storm? Anyway, I'm not going to argue with science-deniers. I'll just post articles here without comment. "The math on staying below 2°C of global warming looks increasingly brutal"
India - the world's biggest carbon creditor! The volume of the icesheet on Greenland is 2.85 million cubic kilometers. That volume, if melted, would raise world sea levels by 7.4 meters. Of course, it all won't melt, the question is how much. Arctic ice is floating ice, so its melt does not raise sea levels. However, the decreasing extent of the ice is a symptom of climate change. Moreover, there is a feedback effect, because sea water reflects less sunlight (absorbs more energy) than ice does, so the more the ice cover reduces, the quicker it becomes warmer. As ocean water warms up it expands, plus the volume of oceans increases with ice melt from glaciers, most notably Greenland and the Antarctic -- and this raises the sea level. The global average sea level is going up at 3.22 mm/year. Analysis: India should follow mainstream development pathway, but using cleanest available technologies. India industries have been pioneering cleaner production to maintain global competitiveness. While in the decade of the 1970s industrial output growth rate was equivalent to energy demand growth rate, in the current decade technology growth has decoupled activity growth and energy demand growth to such an extent that activity growth of 20 times can be delivered by energy growth of five times, thanks to energy saving technology. 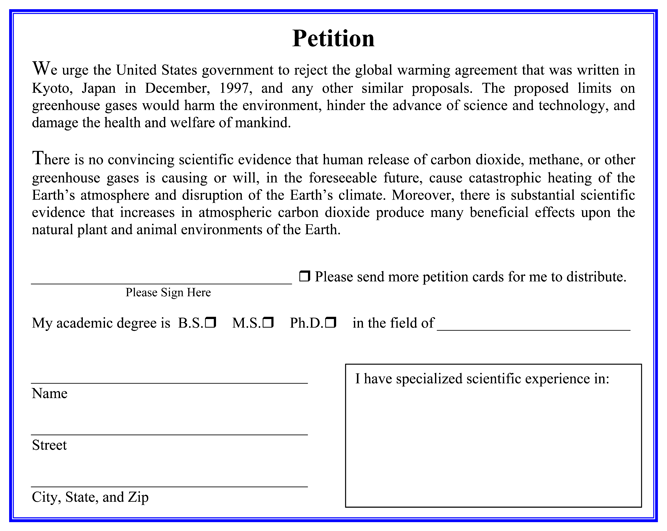 In order for climate science to be settled, there are many requirements. I will list four for now, although I am sure you can think of many more. Then I will expand on those. 1. We must know all variables that can affect climate. 2. We must know how all variables are changing over time. 3. We must know how each changing variable affects climate. 4. We must know about all non-linear changes that take place as a result of changes to variables. main topics have an array of sub topics. As for points 2 and 3, for all of the items listed above, we need to know if the changes, if any, are linear, exponential, logarithmic, sinusoidal, random or some other pattern. For example, depending on who you talk to and the interval you are considering, our emissions of carbon dioxide could be exponential, but the increase in the atmosphere could be linear, but the effect could be logarithmic. Then there are asteroids which could be totally random. As for point 4 above, the easiest example would be to consider a ball with air at 30 C and a relative humidity of 90%. When this is cooled, the gas molecules do not simply slow down indefinitely. At a certain point, the water molecules move so slowly that the hydrogen bonds cause molecules to stick together after collisions to cause liquid water or ice to form. Further cooling causes the various gases to condense to their liquid states and then to freeze to their solid state. Self-organization as a concept preceded Prigogene, but he quantified it and moved it from the realm of philosophy and psychology and cybernetics to the realm of physics and the behavior of nonlinear non-equilibrium systems. To put it into a contextual nutshell, an open, non-equilibrium system (such as a gas being heated on one side and cooled on the other) will tend to self-organize into structures that increase the dissipation of the system, that is, facilitate energy transport through the system. The classic contextual example of this is the advent of convective rolls in a fluid in a symmetry breaking gravitational field. Convection moves heat from the hot side to the cold side much, much faster than conduction or radiation does, but initially the gas has no motion but microscopic motions of the molecules and (if we presume symmetry and smoothness in the heated surface and boundaries) experiences only balanced, if unstable, forces. However, those microscopic motions contain small volumes that are not symmetric, that move up or down. These small fluctuations nucleate convection, at first irregular and disorganized, that then “discovers” the favored modes of dissipation, adjacent counter rotating turbulent rolls that have a size characteristic of the geometry of the volume and the thermal imbalance. The point is that open fluid dynamical differentially heated and cooled systems spontaneously develop these sorts of structures, and they have some degree of stability or at least persistence in time. They can persist a long time — see e.g. the great red spot on Jupiter. The reason that this is essentially a physical, or better yet a mathematical, principle is evident from the wikipedia page above — Prigogene won the Nobel Prize because he showed that this sort of behavior has a universal character and will arise in many, if not most open systems of sufficient complexity. There is a deep connection between this theory and chaos — essentially that an open chaotic system with “noise” is constantly being bounced around in its phase space, so that it wanders around through the broad stretches of uninteresting critical points until it enters the basin of attraction of an interesting one, a strange attractor. At that point the same noise drives it diffusively into a constantly shifting ensemble of comparatively tightly bound orbits. At that point the system is “stable” in that it has temporally persistent behavior with gross physical structures with their own “pseudoparticle” physics and sometimes even thermodynamics. This is one of the things I studied pretty extensively back when I did work in open quantum optical systems. There is absolutely no question that our climate is precisely a self-organized system of this sort. We have long since named the observed, temporally persistent self-organized structures — ENSO, the Monsoon, the NAO, the PDO. We can also observe more transient structures that appear or disappear such as the “polar vortex” or “The Blob” (warm patch in the ocean off of the Pacific Northwest) or a “blocking high”. Lately, we had “Hurricane Joaquin”. Anybody can play — at this point you can visit various websites and watch a tiny patch of clouds organize into a thunderstorm, then a numbered “disturbance with the potential for tropical development”, then a tropical depression, and finally into a named storm with considerable if highly variable and transient structure. All of these structures tend to dissipate a huge amount of energy that would otherwise have to escape to space much more slowly. They are born out of energy in flow, and “evolve” so that the ones that move energy most efficiently survive and grow. Once again, one has to bemoan the lack of serious math that has been done on the climate. This in some sense is understandable, as the math is insanely difficult even when it is limited to toy systems — simple iterated maps, simple ODE or PDE systems with simple boundary conditions. However, there are some principles to guide us. One is that in the case of self-organization in chaotic systems, the dynamical map itself has a structure of critical points and attractors. Once the system “discovers” a favorable attractor and diffuses into an orbit, it actually becomes rather immune to simple changes in the driving. Once a set of turbulent rolls is established, as it were, there is a barrier to be overcome before one can make the number of rolls change or fundamentally change their character — moderate changes in the thermal gradient just make the existing rolls roll faster or slower to maintain heat transport. However, in a sufficiently complex system there are usually neighboring attractors with some sort of barrier in between them, but this barrier is there only in an average sense. In many, many cases, the orbits of the system in phase space have a fractal, folded character where orbits from neighboring attractors can interpenetrate and overlap. If there is noise, there is a probability of switching attractors when one nears a non-equilibrium critical regime, so that the system can suddenly and dramatically change its character. Next, the attractors themselves are not really fixed. As one alters (parametrically for example) the forcing of the system or the boundary conditions or the degree of noise or… one expects the critical points and attractors themselves to move, to appear and disappear, to get pushed together or moved apart, to have the barriers between them rise or fall. Finally (as if this isn’t enough) the climate is not in any usual sense an iterated map. It is usually treated as one from the point of view of solving PDEs (which is usually done via an iterated map where the output of one time step is the input into the next with a fixed dynamics). This makes the solution a Markov Process — one that “forgets” its past history and evolves locally in time and space as an iterated map (usually with a transition “rule” with some randomness in it). But the climate is almost certainly not Markovian, certainly not in practical terms. What it does today depends on the state today, to be sure, but because there are vast reservoirs where past dynamical evolution is “hidden” in precisely Prigogene’s self-organized structures, structures whose temporal coherence and behavior can only be meaningfully understood on the basis of their own physical description and not microscopically, it is completely, utterly senseless to try to advance a Markovian solution and expect it to actually work! Two examples, and then I must clean my house and do other work. One is clearly the named structures themselves in the climate. The multidecadal oscillations have spatiotemporal persistence and organization with major spectral components out as far as sixty or seventy years (and may well have longer periods still to be discovered — we have crappy data and not much of it that extends into the increasingly distant past). Current models treat things like ENSO and the PDO and so on more like noise, and we see people constantly “removing the influence of ENSO” from a temperature record to try to reductively discern some underlying ENSO-less trend. But they aren’t noise. They are major features of the dynamics! They move huge amounts of energy around, and are key components of the efficiency of the open system as it transports incident solar energy to infinity, keeping a reservoir of it trapped within along the way. It is practically speaking impossible to integrate the PDEs of the climate models and reproduce any of the multidecadal behavior. Even if multidecadal structures emerge, they have the wrong shape and the wrong spectrum because the chaotic models have a completely different critical structure and attractors as they are iterated maps at the wrong resolution and with parameters that almost certainly move them into completely distinct operational regimes and quite different quasiparticle structures. This is instantly evident if one looks at the actual dynamical futures produced by the climate models. They have the wrong spectrum on pretty much all scales, fluctuating far more wildly than the actual climate does, with the wrong short time autocorrelation and spectral behavior (let alone the longer multidecadal behavior that we observe). The second is me. I’m precisely a self-organized chaotic system. Here’s a metaphor. Climate models are performing the moral equivalent of trying to predict my behavior by simulating the flow of neural activity in my brain on a coarse-grained basis that chops my cortex up into (say) centimeter square chunks one layer thick and coming up with some sort of crude Markovian model. Since the modelers have no idea what I’m actually thinking, and cannot possibly actually measure the state of my brain outside of some even more crudely averaged surface electrical activity, they just roll dice to generate an initial state “like” what they think my initial state might be, and then trust their dynamics to eventually “forget” that initial state and move the model brain into what they imagine is an “ensemble” of my possible brain states so that after a few years, my behavior will no longer depend on the ignored details (you know, things like memories of my childhood or what I’ve learned in school). They run their model forward twenty years and announce to the world that unless I undergo electroshock therapy right now their models prove that I’m almost certainly destined to become an axe murderer or exhibit some other “extreme” behavior. Only if I am kept in a dark room, not overstimulated, and am fed regular doses of drugs that essentially destroy the resolution of my real brain until it approximates that of their model can they be certain that I won’t either bring about World Peace in one extreme or cause a Nuclear War in the other. After reading this article, do you think climate science is settled? If not, do you think it will be settled in your lifetime? ^ Brilliant Satya ji. Models are considered to 'be all- end all' of discussions in almost all aspects of modern education which is not restricted to healthcare, economics and as your essay shows - climate change. Is there any research on if it is physically possible to head this off. Having looked at the numbers India is not rich enough yet to really do anything about this. Even the rich countries may not be able to do anything. I think most of the change is baked in at this point. What India can do is prepare for the inevitable. The numbers are just too formidable…. OK, so how long will it take for the apocalypse to arrive according to global warming theory? At what point will we clearly know one way or other? Below is an extract from hacked emails between Swedish Prof. Wibjörn Karlén and Kevin E. Trenberth, who is part of Climate Analysis Section at the USA National Center for Atmospheric Researh. [Karlen] In attempts to reconstruct the temperature I find an increase from the early 1900s to ca 1935, a trend down until the mid 1970s and so another increase to about the same temperature level as in the late 1930s. A distinct warming to a temperature about 0.5 deg C above the level 1940 is reported in the IPCC diagrams. I have been searching for this recent increase, which is very important for the discussion about a possible human influence on climate, but I have basically failed to find an increase above the late 1930s. [Trenberth] This region, as I am sure you know, suffers from missing data and large gaps spatially. How one covered both can greatly influence the outcome. In IPCC we produce an Arctic curve and describe its problems and character. In IPCC the result is very conservative owing to lack of inclusion of the Arctic where dramatic decreases in sea ice in recent years have taken place: 2005 was lowest at the time we did our assessment but 2007 is now the record closely followed by 2008. Anomalies of over 5C are evident in some areas in SSTs but the SSTs are not established if there was ice there previously. These and other indicators show that there is no doubt about recent warming; see also chapter 4 of IPCC. [Karlen] In my letter to Klass V I included diagram showing the mean annual temperature of the Nordic countries (1890-ca 2001) presented on the net by the database NORDKLIM, a joint project between the meteorological institutes in the Nordic countries. Except for Denmark, the data sets show an increase after the 1970s to the same level as in the late 1930s or lower. None demonstrates the distinct increase IPCC indicates. The trends of these 6 areas are very similar except for a few interesting details. [Trenberth] Results will also depend on the exact region. Prof Karlen goes on wild goose chase and tries to replicate Trenberth's findings and most times his gets different results. This is hardly the first time environmental groups have tried end-arounds to cope with resistance to their policy proposals. Several decades ago, some environmental activists suggested that utilities that spent money on coal fired power plants could be charged with “imprudence” when carbon taxes were imposed, and forced to pass the subsequent losses onto their shareholders. Anyone who sold their utility stocks expecting such penalties would apparently have grounds for a case. Ironically, a number of peak oil advocates called for legal action against the U.S. Geological Survey for supposed dishonesty in its resource estimates, a laughable charge which apparently resulted from misinterpretation of what they reported, which was then repeated ad nauseum by peak oilers without double checking its validity. And if the claim is that ExxonMobil was dishonest and should be penalized for that, where do I start? How about Al Gore’s “An Inconvenient Truth,” which was found to have numerous errors. Maybe global warming activists should sue Al Gore for discrediting them? And frankly, while an effort to criminalize ExxonMobil’s activities will sound really good to the “core” audience, but more likely Americans will view it with distaste. Especially since it seems so hypocritical that it should feature on the Daily Show on Comedy Central (just to show they’re unbiased!). The northeastern quadrant of Greenland, and most importantly the Jacobshavn Valley, is in close proximity to the southern terminus of the Mid Arctic Rift System (see Locator Map). Other scientists have taken this as strong evidence that this part of Greenland is faulted and more tectonically active than most other portions of Greenland. Recent seismic activity in this region supports this notion. his rapid change in Jacobshavn Glacier flow rate is illustrated on the NASA map above as a unique and a very linear trend that fits the topographic expression of the Jacobshavn Valley. - Glaciers do not melt uniformly as would be expected from atmospheric global warming, rather the melting and advancing of the glacial is complex and therefore more likely associated with geological forces. - The most significant and most recent glacial melting occurs in what is likely a geologically faulted linear valley that is theorized to have increased heat flow. - Sub-glacial freshwater lakes have been identified. James Edward Kamis is a Geologist and AAPG member of 40 years and has always been fascinated by the probable connection between Geology and Climate. Years of research / observation have convinced him that the Earth’s Heat Flow Engine, which drives the outer crustal plates, is also an important driver of the Earth’s climate. The Chandigarh Administration’s ‘model solar city project’ has been selected as India’s solar theme at the 21st meeting of the Conference of the Parties to the United Nations Framework Convention on Climate Change (COP21) to be held in Paris from November 30 to December 11. The decision was taken in a meeting in Delhi today. Prime Minister Narendra Modi will lead India’s delegation to the UN’s climate change summit. If the precise timing of rainfall/melt events is critical to the ice sheets flow response, predicting the future of the Greenland ice sheet may therefore be a more difficult task than was originally thought. Renewable energy supply in eight major economies will collectively more than double by 2030 due to new national climate and energy plans, according to a study by the think tank World Resources Institute (WRI). Total clean energy supply from eight of the world’s 10 largest greenhouse gas emitters – Brazil, China, the European Union, India, Indonesia, Japan, Mexico and the United States – will jump to 20,000 terawatt hours (TWh) from around 9,000 TWh in 2009. That is equivalent to India’s current energy demand. “These new renewable energy targets send strong signals to energy markets and investment circles,” said Jennifer Morgan, Global Director, Climate Program, WRI. - Temperature changes between 1900s-2000s aren't unidirectional and don't support global warming due to man made factors. IPCC claims are disputed to say the least and 'made-up' to suit the agenda at the worst. - Antarctica and Greenland Ice melting findings are not uniform and don't (definitely) support man made factors to be the cause. NASA claims are ambivalent. b) that we don't need 'perfect' consensus but broad consensus is enough. That 'broad enough' consensus is also elusive. I consider Gupta ji to be one of the intellectuals of this forum but this goes to show how even such people can be made (inadvertent?) ambassadors for a cause and/or lose a perspective to push convenient looking theory. However, extrapolation of a localized phenomenon to global scope will need an insanely huge leap of faith than in actual scientific foundation. What part of any finding in a room/garden (localised area, limited variables) by a certain being (limited observations, limited time) should apply to the entire planet and that too for perpetuity? And questioning this is science denying? This is actually symptomatic of entire hoopla around global warming debate as to make a claim, call it so basic that if you question it you don't even need to be engaged and you are a science denier. A working paper from the US National Bureau of Economic Research has found one hot day, defined as over 26 degrees, lead to 1100 fewer babies nine months down the track. The US currently experiences on average 30 days over 80 degrees Farenheit, or 26 degrees Celcuis, in a year, but climate researchers believe with climate change that number could rise to up to 90 such days a year. This would mean 100,000 <shouldn't it be only 11k few babies assuming he means fewer babies?> babies would be born each year in the US alone. johneeG wrote: OK, so how long will it take for the apocalypse to arrive according to global warming theory? At what point will we clearly know one way or other? 80-400 years. By that time it will be too late. The problem with "Ocean Warming" (I do not call it global warming., calling it ocean warming is better)., is that it may lead to a runaway green house effect and we may end up like Venus., only with a large amount of water vapour in the atmosphere. 1. Arctic ocean and Greenland ice sheets are shrinking precipitously. Effect of this is seen on Polar bear populations. 1. Effects of ocean acidification is yet to be measured! Other effects include migration of diseases, species (plant and animal and bird alike). Fact is global warming is real and current. We can sink our heads into sand like ostrich and deny the science behind it. Isn't that like applying band aid on a compound fracture? Chart the data for last five years and extrapolate it to next 10 years. And project yourselves what it will entail. Note this is the raw data as closest as you can get and is sourced globally.